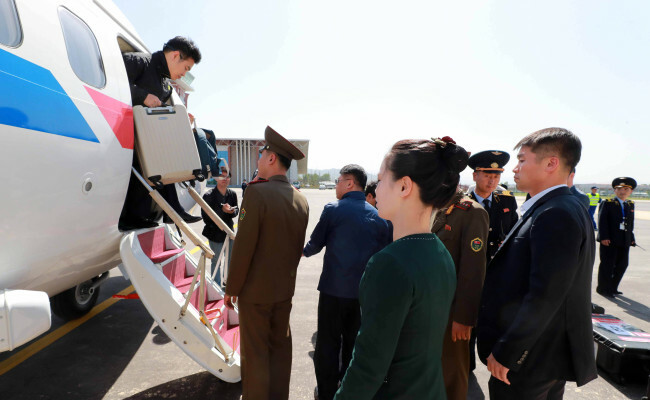 Eight South Korean reporters on Wednesday took a train to Punggye-ri, North Korea, to watch the dismantling of the major nuclear test site, after the regime accepted them into the country at the last minute. The special train departed from Wonsan for Punggye-ri at around 7 p.m., carrying reporters from South Korea, the US, China, Russia and the UK. The closing of the nuclear site could happen on Thursday, depending on weather, a North Korean official said. The reporters are expected to travel some 416 kilometers on the train moving at an estimated speed of 30 kilometers per hour to the Punggye-ri nuclear test site located at a valley on the 2,205-meter Mantap mountain, according to a source. The train ride is expected to take about 12 hours due to the poor condition of the railroad. Among the four tunnels at the Punggye-ri site, where the North conducted all of its six nuclear tests including the most powerful one in September, three tunnels remain intact, the source said. The first tunnel was shut down due to radiation contamination. The reporters will be able to report on the dismantling ceremony once they are back to the press center. 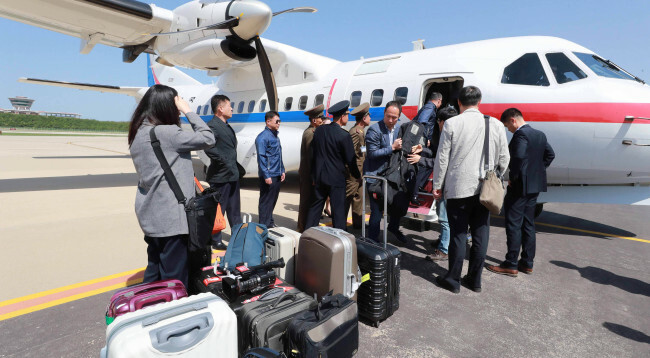 The South Korean pool of reporters landed at Kalma Airport in Wonsan at around 2:50 p.m., after leaving an airbase in Seongnam, south of Seoul, on a state-owned cargo plane at 12:30 p.m. They arrived at the press center in Wonsan at around 16:50 p.m., where reporters from other countries have been waiting to be guided to the nuclear testing site. 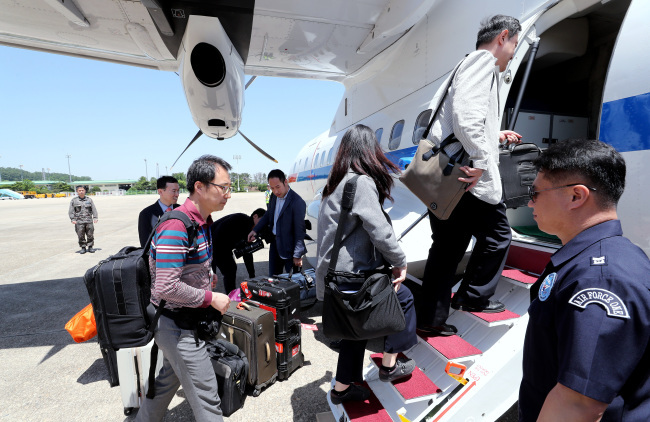 The foreign journalists arrived in Wonsan on Tuesday by a chartered plane from Beijing. 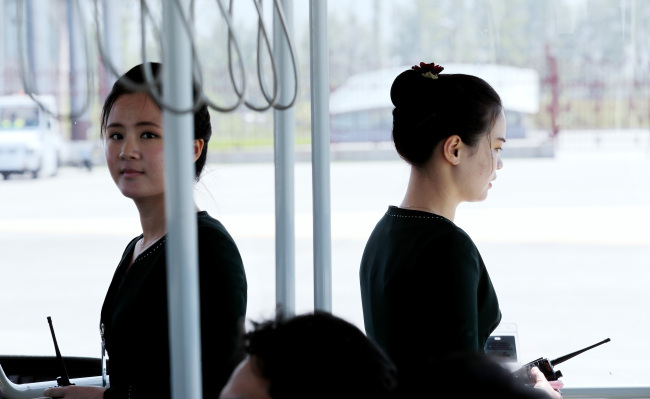 In a dramatic turn of events, North Korea received the names of the South Korean reporters through a hotline at the inter-Korean border village of Panmunjeom on Wednesday morning, the Unification Ministry said, after refusing to accept it several times in the past few days. The North’s move came after South Korean President Moon Jae-in and US President Donald Trump held a summit in Washington to discuss North Korea. The government welcomed the North’s decision. “We expect that this will serve as a starting point for accomplishing complete denuclearization as swiftly as possible through the US-North Korea summit and talks at various channels,” Unification Ministry spokesperson Baik Tae-hyun told reporters during a regular press briefing. The reclusive regime might have changed its mind after Moon showed his efforts to reassure the US about the North’s sincerity about denuclearization, and after the US reiterated its commitment to giving a security assurance to the North, analysts say. “I think the North reserved the decision to accept South Korean reporters until after the South Korea-US summit,” said Hong Min, a senior researcher at the Korea Institute for National Unification. Trump reassured North Korean leader Kim Jong-un would remain in power should he relinquish the country’s nuclear weapons in his opening remarks during the meeting with Moon. President Moon’s effort to actively mediate between North Korea and the US, and to persuade Trump to proceed with the summit with Pyongyang might have led the North Korean leader to change his mind, another expert said. The North appeared to be disappointed with the South over South Korea-US joint air combat drills and the issue of repatriation of North Korean defectors, which led the regime to unilaterally call off high-level talks with the South last week, said Kim Dong-yub, a professor at Kyungnam University’s Far East Institute.